After five intense months searching for a new job, I’m excited and nervous to share that I’m returning to work in the public sector as a full-time, temporary Urban Planner I at the City of Alexandria, VA. I previously worked in the public sector as a Parks Planning Intern at Oregon Metro (MPO for Portland region), Planning Intern at the Town of Davidson, NC, and Planning Intern at Charlotte DOT. The temporary Alexandria job starts tomorrow, February 23 and ends on June 29, 2018, so I’m still searching for a permanent job. While I’m stressed about still having to search for a permanent job, I’m excited and nervous to be working a full-time planning job again. As an Urban Planner I at the City of Alexandria, I’ll help lead the planning, execution, and follow-up for a five-day intensive community planning charrette for the Route 1 South Housing Affordability Strategy. You can learn more about this project here. The charrette is Monday, February 26-Friday, March 2 from 7am-9pm, so I’ll be working 70 hours (includes breaks) during my first full week! The below video explains what will be discussed at the charrette. While I’m aware of housing affordability issues, I didn’t take a housing policy course at UNC Charlotte or Portland State University because I was focused on transportation planning courses. I’m excited and nervous to expand my knowledge and work experience to housing policy. Since active transportation projects often cause housing to be more expensive and I still want to be an active transportation planner, I’m looking forward to learning new tools I can use as an active transportation planner to help resolve housing affordability issues. As you may have noticed, it has been a few months since my last post. I’ve had a burning desire to write, but kept telling myself that the topics are work sensitive or too personal to share publicly. After reading this GGWash post and discovering that I haven’t written a post about my current and previous housing decisions, I finally found a topic that I feel comfortable writing about publicly. Since I have lived in Arlington for almost a year, which means my year lease ends on October 31, this is a good time for me to start reflecting on whether I want to stay put or move nearby. I enjoy my job so I plan to stay in Arlington. My year lease states that I must give my landlord 60 days notice, so I need to make a decision before the end of August. Through this process, I keep comparing my current housing decision with my previous housing decisions in Charlotte, Silver Spring, and Portland. The below post compares and contrasts these decisions. Since I didn’t choose to live in Kannapolis, which is where my parents raised me after I was born in Charlotte, I didn’t include Kannapolis. As this post discusses, the Kannapolis home I was raised in has a Walk Score of zero! Even though I was rushed to find housing in a competitive market before starting my new job, I may have found the cheapest housing within a walkable distance of a light rail station, frequent service bus lines, and several regional trails. I’m paying less than $900 per month (plus $50 for water and $35 for my portion of WiFi) for a room in a 10-room house. I earn enough through my job that I could spend more on housing, but I don’t see the need to spend more when I’m already close enough to my destinations to continue living car-free. Plus, good housemates aren’t guaranteed when renting so I treasure this at my current home. I can use the savings to go on more expensive vacations and prepare for owning a condo or house. While many of my NC family and friends have been shocked by how much I pay for housing, I think they find it challenging to understand how much I save by living car-free. As the below table shows, which I found in this article, walkable places reduce combined housing and transportation costs. Most people don’t calculate all the costs involved with owning, maintaining, and driving an automobile. For example, I think most people don’t calculate parking costs (could be hidden if their employer takes parking out of their paycheck or doesn’t pay them more because their employer is paying for expensive parking), poor mental health from being stuck in daily traffic congestion and not spending much time with their family, poor physical health from not exercising enough and becoming obese, etc. My boss covers most of my transportation costs, so I pay almost zero on transportation each month. He provides me with a free Capital Bikeshare maintenance key that I can use for all my trips, including personal trips. He also provides me with a SmarTrip card for all my work-related transit trips. The largest transportation purchase I have made so far is for this $800 bike that I mostly use for shopping and trips where Capital Bikeshare isn’t located yet. My housing decision makes using these transportation options much easier because I can easily walk to the Ballston Metro Station to ride transit throughout the DC region and bike throughout the DC region on regional trails or low-stress neighborhood streets. While I rarely use it for personal trips, the DC region also has great carsharing and car renting options and Uber/Lyft. Since I started this blog with the intention of following my life’s journey from living in Kannapolis to where life takes me, I want to share how my current housing decision relates to my housing decisions in Charlotte, Silver Spring, and Portland. My car-light lifestyle started when I moved to Charlotte in 2009 to start undergrad at UNC Charlotte. While I lived car-free when I was in Charlotte, I needed a car to go home to Kannapolis so I barely lived car-light. Even though I sometimes think about how I used to pay about $400 per month for housing in Charlotte, which is less than half of what I currently pay in Arlington, the location of my housing in Charlotte lacks the transportation access that I currently enjoy in Arlington. While I was within easy biking distance of a regional trail that started at UNC Charlotte, the trail didn’t provide me with much transportation access so it was mostly a recreational trail. In addition, I couldn’t walk to any transit stations and the local bus was unreliable. I found it faster to bike on unsafe roads throughout Charlotte than wait for transit to arrive. My fully car-free lifestyle started when I moved to Silver Spring in 2014 to become a Transportation Planning Intern at Toole Design Group. While I didn’t have many choices where to live in Silver Spring because I was seeking short-term housing for just the summer, I was lucky to have a Charlotte friend that had a connection to someone who owns a home in Silver Spring. Thankfully, the home was located in a prime location to live car-free. I was a block from the Sligo Creek Trail, which provided some transportation access in addition to recreation usage. Since I wanted to explore the entire DC region, I enjoyed having access to the car-free (just on the weekend) Beech Drive in Rock Creek Park and Capital Crescent Trail. While the Silver Spring Metro Station was further from home than the Ballston Metro Station is to my current home, I enjoyed having better transit access than I had in Charlotte. The last place I lived before moving to Arlington was Portland. My apartment was next to the SE Salmon/Taylor neighborhood greenway, so I had easy access to a low-volume, low-speed walking and biking route. Sunday Parkways went along this route both years I was in Portland, so this route is prime for walking and biking. While I miss Portland’s neighborhood greenways because Arlington has nothing similar yet, I don’t miss Portland’s hills. Since I have an extreme fear of heights, I didn’t enjoy biking downhill to cross the Willamette River. Yes, Arlington also has hills but I rarely have to bike down them because I work from home and usually do field work in locations with few steep hills. I also miss being within easy (two Portland blocks, which are 200 feet) walking distance of a grocery store in Portland. I enjoyed having the flexibility to walk to the grocery store to get one or two items instead of waiting until I’m almost out of groceries. Since the nearest grocery store to my Arlington home is .6 mile away, I wait until I need enough groceries to fill both bike panniers. 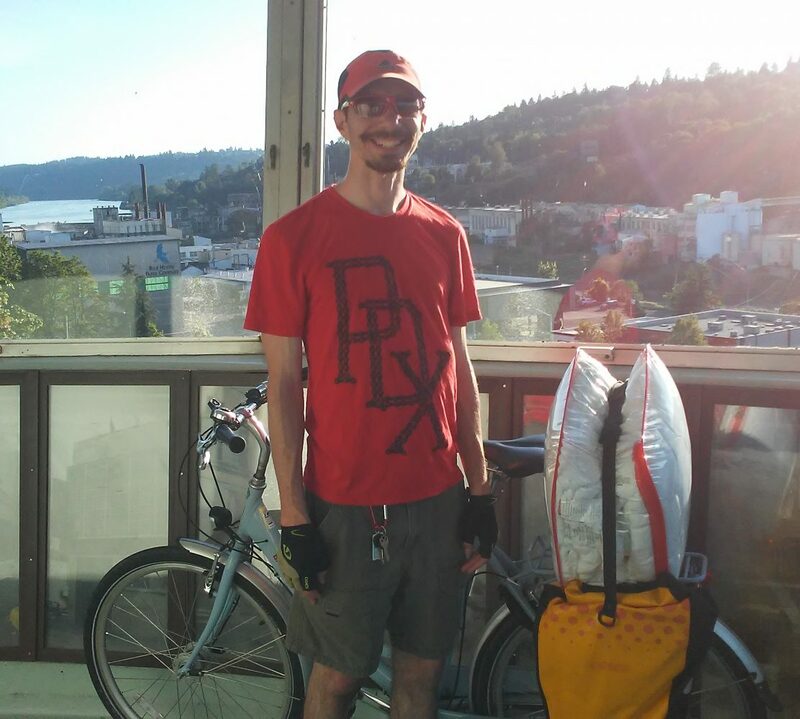 While walking and biking from my Portland home to my destinations was easy, transit wasn’t easy. The Hawthorne and Belmont buses came about every 15 minutes and most of my bike trips only took 15 minutes, so I rarely took the bus. I wasn’t near a MAX station so I couldn’t ride light rail from home. My boss and I were selected to present at the North American Bikeshare Association Conference in Montreal on August 31. We will be presenting during the session titled The “Perfect” Site. My only conference presentation occurred when I presented my high school senior exit project during a poster session at the Southeastern Division of the American Association of Geographers Annual Meeting in 2008. This means the presentation in Montreal will be my first time presenting as a speaker. It will also be my first time attending a conference outside the US. My boss asked me to create our presentation, so I plan to use this presentation to write a blog post.